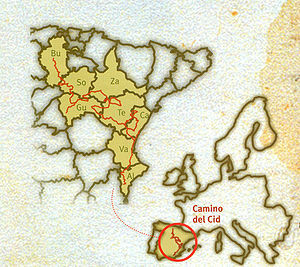 This itinerary follows in the footsteps of the literary “El Cid Campeador” (Cid from the Arabic word Sid=Sir and the latin Campeador= Campus Doctor, victorious in battlefield) as historical figure of great importance in the Middle Ages, through various routes of great historical, heritage and environmental value. El Camino del Cid passes through eight Spanish provinces (Burgos, Soria, Guadalajara, Zaragoza, Teruel, Castellón, Valencia and Alicante) and can be traveled by road, or through rural roads and trails. The aim of this project is the dissemination, promotion and enhancement of the declared Cultural Interest Monuments, literary landmarks listed in the “Song of Mio Cid”, and also those related to the historical figure of the Cid, and the routes specified in the “Camino del Cid”, through a GeoPortal and mobile applications developed under the leading platforms: Apple iPhone OS and Google's Android. The project was carried out by the company COTESA, together with funding from the Goverment of Spain through Ministry of Education, Culture and Sport, and the , and the support of CAMINO DEL CID Consortium.